During 2018 CCE is updating its range of products with a new and more efficient version of the classic model Applique. Furthermore, a new model is presented in order to expand the range of face-mounted products: Acoustic Applique has a soft silicone seal, greater noise reduction and it’s certified for 60 minute fire resistance according to american standard UL-10C. — 3 fixing points (screws included) for maximum stability. 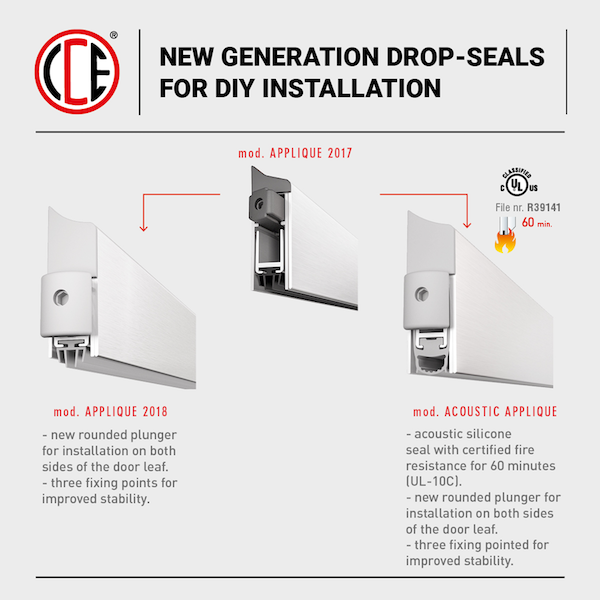 — New rounded plunger which allows the installation of the drop-seal both on doors with opening on the left or with opening on the right. — Soft silicone seal for improved noise reduction.